Thermostable enzymes from thermophiles have attracted extensive studies. In this investigation, a nuclease-encoding gene (designated as GBSV1-NSN) was obtained from a thermophilic bacteriophage GBSV1 for the first time. After recombinant expression in Escherichia coli, the purified GBSV1-NSN exhibited non-specific nuclease activity, being able to degrade various nucleic acids, including RNA, single-stranded DNA and double-stranded DNA that was circular or linear. Based on sequence analysis, the nuclease shared no homology with any known nucleases, suggesting that it was a novel nuclease. The characterization of the recombinant GBSV1-NSN showed that its optimal temperature and pH were 60°C and 7.5, respectively. The results indicated that the enzymatic activity was inhibited by enzyme inhibitors or detergents, such as ethylene diamine tetraacetic acid, citrate, dithiothreitol, β-mercaptoethanol, guanidine hydrochloride, urea and SDS. In contrast, the nuclease activity was enhanced by TritonX-100, Tween-20 or chaps to approximately 124.5% – 141.6%. The Km of GBSV1-NSN nuclease was 231, 61 and 92 μM, while its kcat was 1278, 241 and 300 s-1 for the cleavage of dsDNA, ssDNA and RNA, respectively. Our study, therefore, presented a novel thermostable non-specific nuclease from thermophilic bacteriophage and its overexpression and purification for scientific research and applications. Nucleases are defined as a group of enzymes which are capable of hydrolyzing the phosphodiester linkages of nucleic acids. According to the substrates they hydrolyze, nucleases are divided into two groups: sugar specific nucleases (deoxyribonucleases and ribonucleases) and sugar non-specific nucleases . Sugar non-specific nucleases, characterized by their ability to hydrolyze both DNA and RNA without exhibiting pronounced base preferences, have been detected from a wide variety of sources, such as virus, bacteria, fungi and animals [1–4]. Many of them are extracellular, but some have been found in nuclei, vacuoles, mycelia, mitochondria, conidia, microplasmodia and periplasm [5–11]. Sugar non-specific nucleases play very important roles in different aspects of basic genetic mechanisms, including their participation in mutation avoidance, DNA repair, DNA replication and recombination, scavenging of nucleotides and phosphates for the growth and metabolism, host defense against foreign nucleic acid molecules, programmed cell death and establishment of an infection. Due to their important roles in nucleic acid metabolisms, the sugar non-specific nucleases have been extensively used in molecular biology researches, for example the determination of nucleic acid structure, the rapid sequencing of RNA, the removal of nucleic acids during protein purification and the use as antiviral agents [1, 12–14]. Up to date, more than 30 nucleases have been obtained from microorganisms, such as staphylococcal nuclease from Staphylococcus aureus, S. marcescens nuclease from Serratia marcescens, S1 nuclease from Aspergillus oryzae, P1 nuclease from Penicillium citrinum, BAL31 nuclease from Alteromonas espejiana and NucA from Anabaena [15–17]. With regard to virus, only the PC1 protein from Fowlpox virus and rWSSV-NSN from shrimp white spot syndrome virus are identified as non-specific nucleases . However, all the non-specific nucleases are obtained from mesophiles or mesophilic viruses. No study has reported on nucleases from thermophilic viruses. Compared with mesophilic enzymes, thermostable nucleases may possess novel properties in structures and biological functions. In the present study, a non-specific nuclease gene (termed as GBSV1-NSN) was cloned from a thermophilic bacteriophage GBSV1 for the first time. The sequence homology analysis revealed that it was a novel nuclease. The recombinant GBSV1-NSN nuclease was further characterized. It was shown that the GBSV1-NSN enzyme was thermostable. Based on genome sequence analysis of thermophilic bacteriophage GBSV1, an open reading frame (ORF) [GenBank: EF079892] of GBSV1 shared homologies with phage replication proteins (Fig. 1), which contained a DnaD-like domain, suggesting that the protein encoded by this ORF had the DNA binding capacity. In order to identify its biological function, the ORF (termed as GBSV1-NSN gene) was expressed as GST fusion protein in E.coli. After induction with IPTG at 37°C, the induced and non-induced recombinant bacterium (containing GBSV1-NSN gene) and control bacterium (vector only) were analyzed by SDS-PAGE. A band (about 59.8 kDa) corresponding to the GST-GBSV1-NSN fusion protein was observed in the induced recombinant bacterium containing GBSV1-NSN gene (Fig. 2, lane 4), while no protein was found in the same positions in the induced and non-induced controls (vector only), showing that the GBSV1-NSN gene was expressed. After purification by affinity chromatography, a GST-GBSV1-NSN fusion protein was obtained (Fig. 2, lane 5). The fusion protein GST-GBSV1-NSN was efficiently cleaved by thrombin, yielding the purified GBSV1-NSN with a molecular mass of 33.8 kDa (Fig. 2, lane 6). 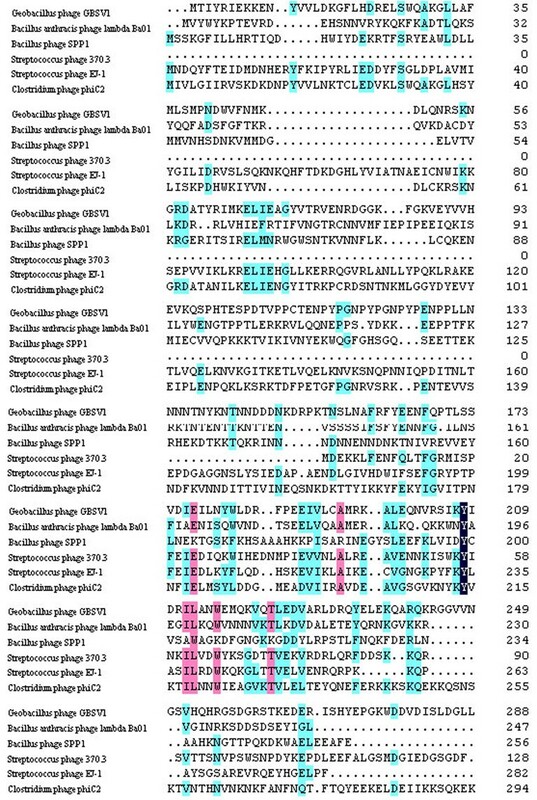 Multiple alignments of phage proteins that contained DnaD-like domains. Phage proteins containing DnaD-like domain were from Geobacillus phage GBSV1 [GenBank: ABK63794], Bacillus anthracis phage lambda Ba01 [GenBank: AAP24466], Bacillus phage SPP1 [GenBank: NP_690731], Streptococcus phage 370.3 [GenBank: AAK33864], Streptococcus phage EJ-1 [GenBank: NP_945250] and Clostridium phage phiC2 [GenBank: YP_001110781]. The DnaD-like domain of GBSV1-NSN held positions 158–227. SDS-PAGE of expressed and purified protein encoded by the GBSV1-NSN gene. 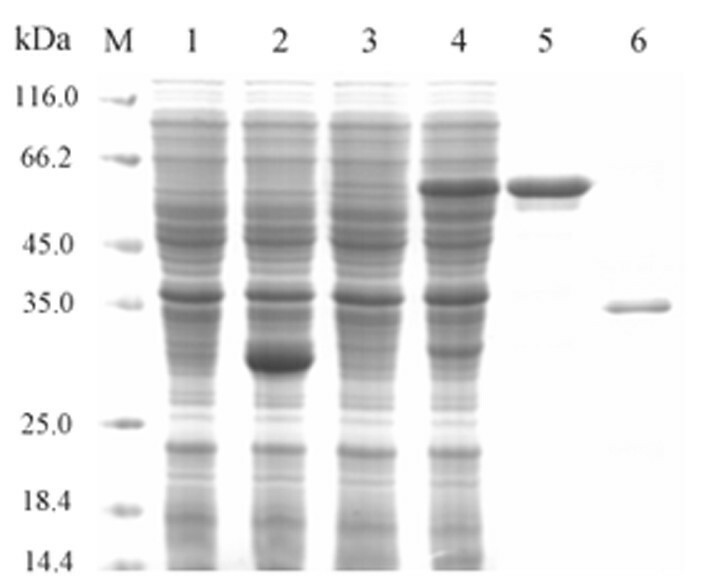 Lanes M, protein marker; 1, control (vector only), non-induced; 2, control (vector only), induced; 3, recombinant bacterium (containing GBSV1-NSN gene), non-induced; 4, recombinant bacterium (containing GBSV1-NSN gene), induced; 5, purified GST-GBSV1-NSN fusion protein; 6, purified GBSV1-NSN. In an attempt to determine the DNA binding capacity of the recombinant GBSV1-NSN, the purified GBSV1-NSN protein was incubated with the genomic DNA of bacteriophage GBSV1. Surprisingly, the DNA was degraded by the GBSV1-NSN protein, suggesting it might be a nuclease. To evaluate its substrate specificity, the purified GBSV1-NSN protein was incubated with various nucleic acids including the circular pGEX-4T-2 plasmid dsDNA, the linear pGEX-4T-2 plasmid dsDNA, the PhiX174 virion ssDNA and the baker's yeast RNA. The results showed that all the nucleic acids could be degraded by the GBSV1-NSN protein (Fig. 3), indicating that it was a non-specific nuclease. Digestion of various nucleic acids by the purified GBSV1-NSN protein. The purified GST protein was used as negative control. The commercial RNase A (A) or DNase I (B, C and D) was also included as positive control. The protein solutions were shown on the top and the nucleic acids were indicated on the right. 1 μg of nucleic acids were respectively incubated with 1.5 μg of the purified GBSV1-NSN protein in 20 μl of reaction buffer at 37°C for six hours. Homology analysis revealed that the GBSV1-NSN protein shared low identities with known nucleases. It had 10.0%, 13.3%, 13.5%, 10.9% and 12.1% identities with those of Staphylococcus aureus thermonuclease [GenBank: P00644], Serratia marcescens nuclease [GenBank: P13717], Anabaena sp. PCC 7120 nuclease [GenBank: YP_227663], Homo sapiens EndoG [GenBank: Q14249] and WSSV-NSN nuclease [GenBank: AAW88443], respectively. These data suggested that the GBSV1-NSN was a novel non-specific nuclease. The nuclease activity estimated at different temperatures indicated that the optimum temperature for the recombinant GBSV1-NSN was 60°C (Fig. 4A). The GBSV1-NSN nuclease activity was decreased with higher temperatures above the optimum. Thermostability assays showed that the GBSV1-NSN nuclease was most stable at 60°C (pH 7.5), retaining more than 80% of its enzymatic activity for at least 2 hours (Fig. 4B). Optimum temperature (A) and thermostability (B) of the GBSV1-NSN nuclease. The nuclease activity of GBSV1-NSN was assayed at various temperatures ranging from 20°C to 80°C. To evaluate the thermostability, the residual enzymatic activities were monitored after incubation of the enzyme solutions (295 μg/ml) in the absence of herring dsDNA (100 μg/ml) at 40, 50, 60 or 70°C (pH 7.5) for 15, 40, 60, 90 or 130 min. The nuclease activity assay was conducted using 100 μg/ml of herring dsDNA as substrate. Each point represented the mean of triplicate assays and the error bars showed the standard deviations. Based on the effects of pH on enzymatic activity, the GBSV1-NSN nuclease exhibited optimal activity at pH 7.5 (Fig. 5A). The recombinant nuclease was stable in the neutral pH ranging from 7.0 to 8.0 (Fig. 5B). It presented higher stability after incubation at 60°C for 3 hours, showing 66, 74 and 71 % residual activity at pH 7.0, 7.5 and 8.0, respectively (Fig. 5B). Effects of pH on enzymatic activity (A) and stability (B). The optimum pH was assayed after incubation in various pH buffers (pH 3.0 to 10.0) at 60°C for 15 min. For pH stability experiments, the GBSV1-NSN was pre-incubated in a series of pH buffers (pH 5.0 to 10.0) for 15, 30, 60, 90, 120, 150 or 180 min before assay. Each reaction mixture consisted of 100 μg/ml herring dsDNA and 295 μg/ml of the purified GBSV1-NSN protein. Each point represented the mean of triplicate assays and the error bars indicated the standard deviations. The effects of different metal ions on the GBSV1-NSN nuclease activity were evaluated as shown in Table 1. In the absence of metal ion, the GBSV1-NSN nuclease was active. The enzymatic activity was obviously stimulated in the presence of Mn2+ and Zn2+ at 10 mM concentration each. Metal ions Li+, Na+, K+, Cs+, Ca2+, Mg2+, Ni2+, Sr2+ and Ba2+ at different concentrations showed very slight inhibition of the GBSV1-NSN activity, retaining more than 80% of its initial activity. However, its activity was strongly inhibited by Cu2+ and Fe3+. With the increasing in Cu2+ or Fe3+ concentration, the nuclease activity decreased sharply. Effects of metal ions on the GBSV1-NSN enzymatic activity. The concentrations of metal ions represented their concentrations in the incubation solutions with the nuclease and in the final nuclease reactions. The error limits shown were the standard deviations. The results indicated that the recombinant nuclease was active when some metal chelators, thiol reagents and detergents were used (Table 2). However, the enzymatic activity was reduced by some enzyme inhibitors or detergents, such as ethylene diamine tetraacetic acid (EDTA), citrate, dithiothreitol (DTT), β-mecaptoethanol (2-ME), guanidine hydrochloride, urea and SDS. Among them, 10 mM of DTT and 0.6 M of guanidine hydrochloride led to a significant reduction of enzyme activity by 34.1% and 51.0%, respectively. In contrast, the nuclease activity was enhanced by TritonX-100, Tween-20 or chaps to approximately 124.5 – 141.6%. Effects of metal chelators, thiol reagents and detergents on the GBSV1-NSN nuclease activity. The concentrations of additives represented their concentrations in the incubation solutions with the nuclease and in the final nuclease reactions. The error limits shown were the standard deviations. The kinetic parameters of the nuclease were obtained from Lineweaver-Burke plot of specific activities at 60°C with different substrates including the double-stranded DNA (dsDNA), single-stranded DNA (ssDNA) and RNA. The results revealed that its Km value was 75, 20, 30 μg/ml and Vmax value was 2.5 × 105, 5 × 104, 5 × 104 Kunitz units·mg-1 for the dsDNA, ssDNA and RNA, respectively (Fig. 6). After calculations, the kcat of GBSV1-NSN nuclease was estimated to be 1278, 241 and 300 s-1 for the dsDNA, ssDNA and RNA substrates, respectively (Fig. 6). The Lineweaver-Burke plot. The kinetic parameters Km and Vmax were estimated by linear regression from Lineweaver-Burk plots. The nucleic acid concentrations were varied in the range of 0–100 μg/ml. All nuclease activity assays were conducted at 60°C and pH 7.5. Each point represented the mean of triplicate assays and the error bars represented the standard deviations. Driven by increasing industrial demands for thermostable biocatalysts, thermophiles have attracted more and more attention as a valuable source of novel enzymes . Most thermophilic enzymes were extensively studied from thermophilic archaea and bacteria. However only a few enzymes from thermophilic bacteriophages have been characterized, for example thermostable RNA ligase , polynucleotide kinase  and lytic enzyme . Therefore, thermophilic bacteriophages are a considerable resource of thermophilic enzymes. In this investigation, the recombinant GBSV1-NSN protein from the thermophilic bacteriophage GBSV1 exhibited non-specific nuclease activity. The results showed that the GBSV1-NSN nuclease was active at temperatures ranging from 20°C to 80°C with an optimal temperature of 60°C, which was higher than those of most of the reported non-specific nucleases. In the respect of effects of metal ions on the enzymatic activity, the GBSV1-NSN was similar to the nuclease α from U. maydis and wheat chloroplast nuclease that did not show an obligate requirement of metal ions for their activities . It was found that Mn2+ or Zn2+ could stimulate the GBSV1-NSN activity. This stimulation was also observed in the ColE7 nuclease which bound a transition metal ion Mn2+ or Zn2+ in its H-N-H motif . However EDTA had a mild effect in reducing the activity of the GBSV1-NSN enzyme. The data suggested that metal ions had a stimulatory effect but were not obligatory for nuclease activity and that they might play roles in stabilizing the enzymatic structure. It could not be ruled out whether the GBSV1-NSN enzyme was copurified with some tightly bound metal ions, as was the case of some other nucleases. This point remained to be further addressed. The amino acid sequence analysis of the GBSV1-NSN revealed the existence of two Cys residues, indicating that the nuclease might contain a disulfide bridge. It was found that the GBSV1-NSN nuclease activity was inhibited by thiol reagents DTT or β-ME, suggesting that its disulfide bridge could play an important role in determining the activity of this nuclease. However the enzyme was stimulated by TritonX-100, Tween-20 and chaps. Comparisons of the catalytic properties of the GBSV1-NSN with the known nucleases suggested that it had a similar efficiency in dsDNA hydrolysis as the Serratia nuclease (SMNase)  and F. succinogenes DNase A . However, it had lower catalytic efficiency than that of Anabaena NucA in cleavage of various nucleic acids and than that of Staphylococcus nuclease (SNase) in cleavage of ssDNA (Table 3). Steady-state kinetic parameters for the cleavage of various nucleic acids by GBSV1-NSN and other nucleases. Although the GBSV1-NSN protein displayed non-specific nuclease activity, it shared no homology to any known nucleases in the primary amino acid sequences. Our data indicated that the GBSV1-NSN was a novel member of non-specific nuclease family, which was thermostable and disulfide bridge-dependent. Based on sequence analysis, the GBSV1-NSN protein was highly homologous with the phage replication protein and contained a DnaD-like domain, suggesting that it might play important roles in bacteriophagic DNA replication. As well known, DNA replication is divided into three main stages, that is initiation, elongation and termination. In some gram-positive bacteria with low G+C content, the DNA replication initiation involves remodeling of a replication origin through the action of the main initiator protein DnaA and primosomal multiprotein cascades including DnaD. These initiator proteins interact with helicases to recruit the DNA primases. DnaD is believed to be involved in the cascade for helicase recruitment . Considering that the GBSV1-NSN nuclease contained DnaD domain, this protein might possess multiple biochemical activities, including the nuclease activity and involvements in the DNA replication initiation, as well as in mismatch bacteriophagic DNA repair. Up to date, the non-specific nucleases already available are obtained from mesophiles. The discovery of thermostable GBSV1-NSN nuclease in this study would facilitate the applications of nucleases in molecular biology researches and in industry at high temperatures, such as the determination of nucleic acid structure, the removal of nucleic acids during protein purification and the use as antiviral agents. Those are merited to be further studied. In this study, we have determined a novel thermostable non-specific nuclease from thermophilic bacteriophage for the first time, which shared no homology with any known nucleases. The characterizations of the recombinant GBSV1-NSN showed that it was a thermostable nuclease. In this investigation, the recombinant GBSV1-NSN could be obtained in large quantity by expression in E. coli. This would facilitate its biotechnological applications. During the culture of Geobacillus sp. 6K51, phage plaques were observed from a thermophilic bacterium isolated from an offshore hot spring in Xiamen of China. The thermophilic bacteriophage (termed as GBSV1) was purified from its host, which was grown at 60°C with shaking (150 rpm) in the medium consisting of 0.2% NaCl, 0.4% yeast extract and 0.8% tryptone (pH 7.0). The GBSV1 contained a double linear genomic DNA of 34683 bp, which had the capacity encoding 55 open reading frames (ORFs). The genome sequencing revealed that it was a novel bacteriophage. The sequence analysis of GBSV1 genome revealed an ORF sharing high homologies with phage replication proteins. To characterize the protein encoded by this ORF (termed as GBSV1-NSN gene), it was expressed in Escherichia coli BL21 (DE3) as a fusion protein with glutathione S-transferase (GST). The GBSV1-NSN gene was amplified from the GBSV1 genomic DNA using primers 5'-CGGGATCCATGACGATATATCGCATCG-3' (BamHI site, italic) and 5'-GCGAATTCTTATAGAAGTCCATCGAGG-3' (EcoRI site, italic). The amplified fragment was cloned into pGEX-4T-2 downstream of GST. The recombinant bacteria were induced with 1 mM of isopropyl-β-D-thiogalactopyranoside (IPTG) when OD600 reached 0.6–0.8. After incubation for an additional 4 to 5 h at 37°C, cultures were harvested by centrifugation (4,000 × g, 10 min, 4°C) and resuspended in 20 ml of ice-cold phosphate-buffered saline (PBS, pH 7.4). Cells were lysed by sonication and the cell debris was removed by centrifugation at 10,000 × g for 15 min. The supernatants were mixed gently with 1 ml glutathione- sepharose beads (Sigma, America) for 2 h at 4°C. After rinsing with ice-cold PBS, the GST fusion protein was pooled with a reducing buffer of 50 mM Tris-HCl and 10 mM reduced glutathione\(pH 8.0). The purified fusion protein was incubated with thrombin (Sigma, America) in a reaction buffer of 50 mM Tris-HCl, 150 mM NaCl, 2.5 mM CaCl2 and 0.1% β-mecaptoethanol\(pH 8.0) at 22°C for 8 h. Subsequently it was applied to glutathione-agarose beads (Sigma, USA) to remove GST. The purified protein was dialyzed in 50 mM Tris-HCl (pH8.0). Homology searches were performed against the sequences in the GenBank database using the BLAST program. Alignments of deduced amino acid sequence were generated with DNAMAN program. To determine the specificity of substrate for the recombinant GBSV1-NSN nuclease, 1 μg of the circular pGEX-4T-2 plasmid dsDNA, the linear pGEX-4T-2 plasmid dsDNA, the PhiX174 virion ssDNA (New England Biolabs, UK) or baker's yeast RNA (Sigma-Aldrich, USA) were respectively incubated with 1.5 μg of the purified GBSV1-NSN protein in 20 μl of a reaction buffer (20 mM Hepes, 50 mM KCl, 2 mM MgCl2, 0.2 mM EDTA, 0.1 mg/ml BSA and 10% glycerol, pH 7.5) at 37°C. Six hours later, 10 μl of the reaction solution was analyzed by electrophoresis on a 1.0 % agarose gel. In the assays, 1.5 μg of commercial DNase I (TaKaRa, Japan) and RNase A (Sigma-Aldrich, USA) were included as controls. All assays were conducted in triplicate. The spectrophotometric method was used to measure the nuclease activity according to the protocol as described previously . One Kunitz unit was defined as the amount of enzyme needed to cause an increase of absorbance of 0.001 ⊿A260·ml-1·min-1·cm-1 at 60°C. Each reaction mixture consisted of 100 μg/ml RNA or DNA, 20 mM Tris-HCl (pH 7.5) and the recombinant GBSV1-NSN nuclease. After incubation for 15 min at 60°C, the reactions were stopped by equal volume of 5% ice-cold perchloric acid. The solutions were held on ice for 10 min and then centrifuged for 5 min at 8000 × g. The supernatants were measured using a Thermo Spectronic UNICAM UV 300 spectrophotometer set at 260 nm. The optimal temperature of the GBSV1-NSN nuclease was measured by performing the enzymatic activity assay at temperatures ranging from 20 to 80°C in the presence of herring sperm DNA (Sigma-Aldrich, USA) as substrate. The thermostability of nuclease was investigated at different temperatures 40, 50, 60 and 70°C after incubation of the enzyme solutions (295 μg/ml) in the absence of 100 μg/ml herring dsDNA (20 mM Tris-HCl, pH 7.5) for 15, 40, 60, 90 or 130 min, respectively. Residual activities were determined under nuclease activity assay conditions using 100 μg/ml of herring dsDNA as substrate. All assays were repeated for three times. The effect of pH on nuclease activity was evaluated at the optimal temperature over a pH range of 3.0–10.0, using five different buffers (all at 20 mM concentrations): sodium formiate (pH 3.0, 3.5), sodium acetate (pH 3.5 to 6.0), imidazole (pH 6.0 to 7.0), Tris/HCl (pH 7.0 to 9.0) and ethanolamine (9.0 to 10.0), under nuclease activity assay conditions. Further study on the pH stability of nuclease was carried out at 60°C by pre-incubation of the enzyme solutions in Tris/HCl buffer systems (pH 5.0 to 10.0) in the absence of substrate for 15, 30, 60, 90, 120, 150 and 180 min, respectively. Then they were subjected to the nuclease activity assay. The assays were conducted in triplicate. The effects of metal ions on nuclease activity were determined by measuring the residual activity of GBSV1-NSN after separate incubation of the enzyme solutions with various metal ions at 60°C and pH 7.5 for 10 min. The concentrations of metal ions in the incubation solutions with the nuclease and in the final nuclease reactions were 0.1, 1.0 or 10 mM and 0.05, 0.5 or 5 mM, respectively. The assays were carried out for three times. To determine the effects of metal chelators, the nuclease was pre-incubated with ethylene diamine tetraacetic acid (EDTA) or citrate at 60°C for 10 min, followed by the nuclease activity assay. The effects of thiol reagents and detergents on the nuclease activity were also monitored by the same procedure as described above. The concentrations of EDTA, citrate, dithiothreitol (DTT) and β-mecaptoethanol (2-ME) were 1 mM or 10 mM in the incubation solution with the nuclease and 0.5 mM or 5 mM in the final nuclease reaction, respectively. The concentrations of SDS, TritonX-100, Tween-20 or 3- [(3-cholamidopropyl) dimethylammonio]-1-propane sulfonate (chaps) were 0.1% or 1% (w/v) in the incubation solution with the nuclease and 0.05% or 0.5% in the final nuclease reaction, respectively. The concentrations of guanidine hydrochloride and urea were 0.6 M and 1 M in the incubation solution with the nuclease and 0.3 M and 0.5 M in the final nuclease reaction, respectively. All assays were performed in triplicate. The protein concentration of purified GBSV1-NSN was determined based on the dye-binding assay method of Bradford , with bovine serum albumin (Sigma, USA) as a standard. 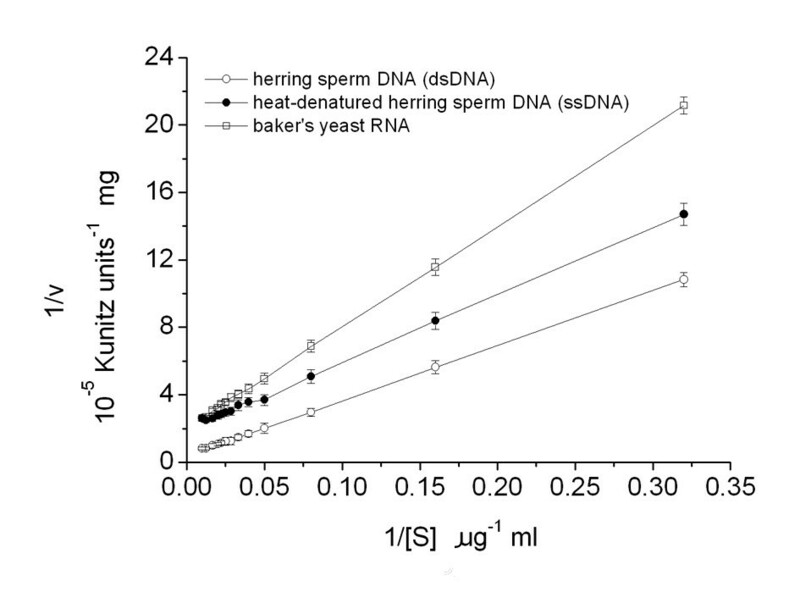 Steady-state kinetic parameters for the GBSV1-NSN nuclease were determined using the Kunitz assay with herring sperm DNA (dsDNA), heat-denatured herring sperm DNA (ssDNA) and baker's yeast RNA. In order to determine Km and Vmax, the nucleic acid concentrations were varied in the range of 0–100 μg·ml-1. All nuclease activity assays were conducted at 60°C in a Tris/HCl buffer (20 mM, pH 7.5). Typical Lineweaver-Burk plots were obtained when 1/[v] was plotted against 1/[S] . Kinetic parameters were estimated by linear regression from Lineweaver-Burk plots. All assays were conducted for three times. To compare the Km and kcat of GBSV1-NSN with those of the known nucleases, the Km values were converted from μg·ml-1 to μM by using a mean molar mass of 330 g·mol -1·nt -1. The Vmax values were converted to kcat by assuming that the molar mass per nucleotide was 330 g·mol -1 and that a change in absorbance of 0.3 A260 accompanied the degradation of 50 μg·ml-1 DNA and 0.25 A260 accompanied the degradation of 50 μg·ml-1 RNA . All the numerical data were analyzed by one-way ANOVA and expressed as mean ± standard deviation. This work was financially supported by the China Ocean Mineral Resources R & D Association (DY105-02-04-05, DYXM-115-02-2-15) and the National Natural Science Foundation of China (40576076). QS conducted the experiments and analyzed the data. XZ drafted the assays, participated in data analysis and wrote the manuscript. All authors read and approved the final manuscript.